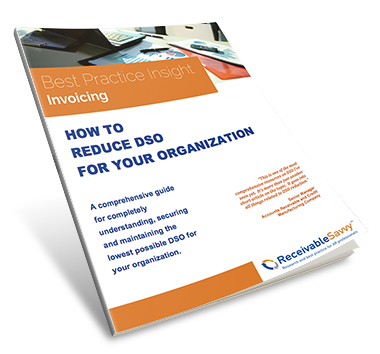 Receivable Savvy Publishes Free Comprehensive DSO Reduction Guide | Company Newsroom of Receivable Savvy, Inc. The Free Best Practice guide was created to help organizations understand the habits and practices of top-performing companies, how they approach DSO reduction and how they go about getting paid faster. Atlanta, GA, February 4, 2016	(Newswire.com) - Receivable Savvy today published its free Best Practice Insight: How to Reduce DSO for Your Organization, a comprehensive, 21-page eBook designed to help organizations understand and implement DSO-reduction practices to ensure they get paid faster. DSO, or Days Sales Outstanding, is a common metric used among Finance and Accounting professionals to determine how long it takes an organization to collect a payment after a sale has been made. By incorporating the practices outlined in this 10-point document, any supplier organization can begin to consistently get paid on time and minimize – or eliminate – instances of late customer payment. Understand which technologies can help their company get paid faster. "Finance and Accounting professionals in the areas of Accounts Receivable and Credit Management will find this document to be much more comprehensive than the occasional article on the topic," said Ernie Martin, Founder and Managing Director of Receivable Savvy. "We wanted to provide a tool that went beyond the usual calculations, incorporated links to helpful resources and identified activities professionals could begin to incorporate immediately." How to Reduce DSO for Your Organization is the first in a series of Order-to-Cash Best Practice eBooks Receivable Savvy will publish throughout the year.